Well 2017 has been absolutely flying by so far! Juggling the horses & work has been even more time consuming than usual since the event season started, and without eventing myself it’s been tough keeping my motivation going at times.Our first scheduled event was cancelled due to the wet weather in April, so we had a rather slow start to the season all round; however the horses had lots of runs out show jumping, dressaging and cross country to make sure they were all ready. It was still a bit of a shock to the system when we arrived at the first event with 4 horses to manage, and we ended up as the last lorry in the field that evening! All of Dickon’s young horses have been making really good progress and stepping up the eventing levels which has been great to see. The yard is as busy as it could be, but luckily we have a great new member of staff to help arrange up to 16 horses and 10 stables… At least the weather is allowing the horses to be out at night! I managed to get Hope out to some dressage, and despite very little preparation due to a lack of time she pulled out 2 really super tests to score 75.2% and 75.8% and win both classes! My dressage saddle for her made so much difference and it was so rewarding to feel the improvements and get lovely comments from the judge. She’s had a couple of other jump outings but sadly is getting rather unfit in the field and so I’ve sadly offered her up for sale as she could be doing so much more and having great success with someone else. Her advert is on my Facebook page: Alex Holman Eventing. Alfie has been building up slowly to make sure he comes back feeling strong and well, which has been a bit of a slow process but nonetheless worth it as he’s feeling very well now. He’s working well on the flat and starting to really get to grips with the trickier movements especially his shoulder in which has become very consistent recently. He’s jumping very well too, and has come out as he felt at the end of last season which is a relief. 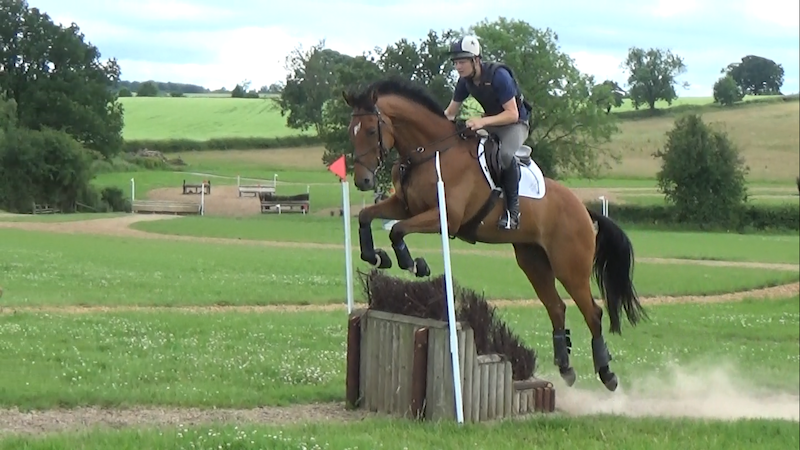 Fingers crossed we’re all ready for his first event on 9th July, where we’ll be running back out at the BE Novice at Bicton Arena, he’ll certainly be as excited as I am to get back out on a proper cross country course! We’ll also be entering our first international in the CCI* at Hartpury in August, and luckily the generous support from Ascot will help with the substantial entry fee, as well as a few other extras we need. Hopefully all goes well in the lead up to that!